What kind of music will you play? We will focus on music from the 1920’s and 1930’s, but some early 1940’s tunes may creep into the mix. The band will be playing arrangements that are either transcribed from original recordings or reproductions of original recordings (or a combination of both – sometimes having a hi-fi reference helps a lot) and arrangements that our maestro Lucian Cobb creates on his own, based on songs from this era. We will be playing a few arrangements Lucian has done in the past and songs you may have heard vocalist Laura Windley perform, but the majority of the material will be new. Most importantly, this music will swing! How many people will be in the band? Right now, we really like the idea of having either a 7 or 8 piece band, giving us either a 3 or 4 piece rhythm section with 3 horns, plus a vocalist. With this format, we are able to play arrangements of big band or smaller group charts, giving us a fuller sound than a jazz combo. We are also able to offer a more affordable alternative to a big band. Will you have a smaller group? Unfortunately, we will not have a smaller group. We understand that this limits the venues we can play, especially locally, but we are more interested in creating a specific sound. Who is going to be in the band? 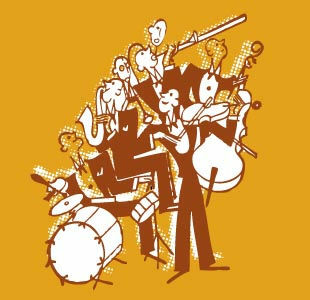 We’d like to have a set lineup, but in the jazz world this is not always possible – some of our band members have bands of their own, so we are fortunate enough to have other jazz musicians that we have worked with in the past to fill their shoes. You can be sure you will see Peter Lamb (sax), Al Strong (trumpet), Aaron Tucker (drums), Jason Foureman (bass), Aaron Hill (sax), Rich Willey (trumpet), Kyle Santos (trumpet), Mark Wells (piano), and other great jazz musicians from the Triangle and beyond who we enjoy performing with and will lend their unique talents to this endeavor. When will you be ready to play? The goal is to be ready in March and, indeed, we’ve already got gigs in March 2012 and beyond! For more details, see our calendar page. We do have a show on February 23 for RDU Rent Party – we invite everyone to come to this sneak preview! Our bread and butter will be swing dances, and we’ve already got a wedding on the books. We are also available for community events, outdoor festivals, jazz societies, schools, private parties, charity events/fundraisers, historic and reenactment-related events, and, really, anywhere that people enjoy music. We are looking to travel outside of the Triangle area of North Carolina and would welcome gig opportunities in other cities.